Showing results for tags 'questing'. Hey all Anyone got a profile example that demonstrates the use of "use item on opponent with less than 25% health"? I can get a bot to attempt to use an item on a mob before combat... but once the bot starts fighting it seems it will only kill the mob- not use the item. http://www.wowhead.com/quest=28000/do-the-imp-possible is a good example. He should prove easy pickings. Weaken him with combat, and then use this enchanted sack to capture him. Then I'll do the talking... I can see how i could use fight classes to use item at >25%, is there a way to put that sort of action in a quest profile though? This addon helps the bot quick up / hand in quests as well as interect / chat with NPC for quest objectives. Automatically picks up and accepts quests from items as well as auto-completes pop up quest dialog. Must have for anyone using quest profiles for levelling. 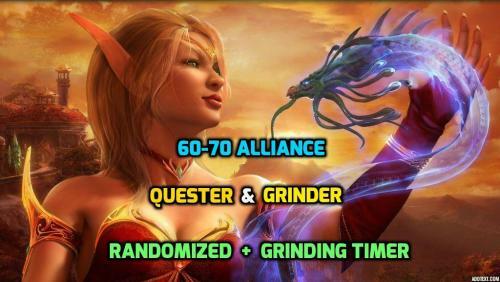 I was wondering if anyone was working on, or might be willing to make a Questing profile for lvl 1 Pandas taking them from the starting quest to the final choice to pick Alliance or Horde. I've tried looking through all information avalible and watched all the tutorial videos I could find on YouTube, and was unable to really be sure without asking, is this bot able to efficiently do the Brew Fest Daily Quest "There and Back Again" (http://www.wowhead.com/quest=11122/there-and-back-again)? I have 24 toons total and just cannot deal with 13-15 minutes of this tedious quest per toon per day, but the extra 34-40 tickets per toon per day is too much to not bother with. If it is capable of doing it, I'll happily buy a year subscription right now. After questing etc as moonkin and feral, feral is way easier and it tears through the world quests etc way after. I was banging my head with the moonkin with it getting stuck and dying lots etc, so I hope this thread saves other druids lots of time! Quest profile for Undead 1-20. 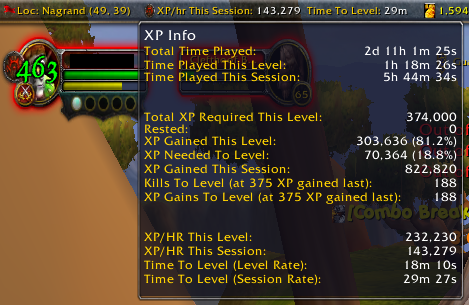 This profile was built for bots with no heirlooms and no guild XP bonus's. The quest rewards are geared towards leather wearers, everyone can use the XP tho =). no class quests. From 1 to level 8/9 is clean. The bot will get stuck at lvl 8 ( approx 80 minutes in) when at the bulwark as the next quest is in Fairbreeze village in Eversong woods and sometimes it wont take the flight path( i need to fix this part).. until then keep an eye out. Once your in Eversong woods it smooth sailing. to about 19-20 (approx 8 hours). There are some phasing issues around Dethknell which are causing me some grief so you may need to babysit first hour or so, if the bot is trying to pick up a quest from thin air /reload and you should be moving again. unfortunately not much i can do there. Settings! You need to enable selling white items otherwise the bot will just stop as it wont be able to pick up quest items. I also advise getting additional bags asap as the constant running to town to sell can really mess up the exp rate. Put the search radius to 35/40 Allow attack target already in fight Do no Sell list Rotting Heart Spinal Dust Linen Cloth Wool Cloth first 2 are actually important... second two are just for gold The bot may collect some quests that it wont attempt to complete...you need to abandon them manually at the end. I'm looking to start a new profile for 20-30, just need to find the time to do them... If you have anything constructive to add let me know and i will add it to the profile. I usually like to run party and carry several alts but tabbing and pausing all profiles to turn in quests is super annoying. Anyway to do what I want on not specific quest. I suggest, Auto turn in nearby quests. You should add a /follow especially when mounted or out of combat. If Party Leader it follows mounts it should mount instead of waiting distance. STILL IN QA MODE Work in progress need some people to do some QA. If you hit an issue let me know where / what.. dont just say "its broken" Need to be lvl 58 and take portal from Org to HFP. Profile starts once your inside the HFP portal and (from what i have seen) its all AFK from there. will take a few hours and i did trim some problem quests but its free EXP. Got some free time coming up so il add some more- want to get this one tested as a solid profile as a start. Horde profile for Gorgrond quests. Hasn't gone through full QA just yet so until further notice keep an eye on the profile. Starts with Durotan on the gorgrond / frostfire border. its 99% AFK, the only issue is the base selection about 15 minutes into the profile which you will have to do manually at this time. it should pop up with a messagebox. CHOOSE THE LUMBERYARD! I didn't script the final quest "strike while the iron is hot" so i think you end up with 3/4 chapters completed, you can do that manually if you wish. Added a filler on the end so once its done all the quests it will go do a grind until you stop it. **QA done- any issues like me know** Continuation from the other 2 questing profiles I made for Horde. This profile does quests in both zones of STV. Start the profile in Grom Gol (off the zepplin) and its AFK from there. Had some tough and annoying pathing issues getting the bots into booty bay, so unfortunately i had to skip those quests...meaning 33-35 is a grind portion. If you see this starting up i would recommend queuing for an instance and getting some new gear if possible. 28-35 will take about 4-5 hours assuming all goes well. I cant fix it if i dont know it broken so if you hit an issue with the profile let me know. First release quest profile for Horde 20-28. 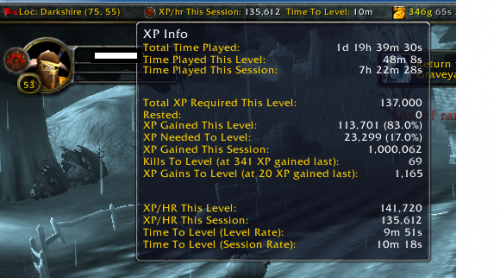 This profile was built tor bots with no heirlooms and no guild XP bonus's. This should pick up from the 1-20 quester profile http://wrobot.eu/files/file/571-undead-quester-1-20/ . If you completed that profile I highly recommend completing some random dungeons to pick up some gear as it will help a lot with this profile. most of the bots I used for QA on this profile started at 21-22 and the ones with instance gear faired much better. There are some grinder portions to the profile so starting at 20 wont be an issue if you have the gear to survive (you will be fine if your running heirloom'd bots). You need to start this profile in the Northern Barrens at kadrak... get there yourself. Settings! You need to enable selling white items otherwise the bot will just stop as it wont be able to pick up quest items. I also advise getting additional bags asap as the constant running to town to sell can really mess up the exp rate. Put the search radius to 35/40 Allow attack target already in fight Define a ground mount... YOU NEED YOUR OWN FIGHT CLASS ...or one of mine The bot may collect some quests that it wont attempt to complete...you need to abandon them manually at the end. I'm looking to start a new profile for 28-35, just need to find the time to do them... If you have anything constructive to add let me know and i will add it to the profile. Maybe i dont know what im doing? Maybe im an idiot or being to impatient? but i find this program to be awful. again maybe its me, but have the scripts that our written just seem to be bad. again this is referring to new toons and trying to bot level. but the fight classes just seem to spam one action if you can get it to do that. the grinder just causes you to die again and again and all gear ruined without the bot repairing.again if someone can maybe point me in the right direction it would be great. or a tip on whats the best lvl profile. thanks in advanced and thanks to all the coders/programmers putting out scripts, your time and work is appreciated.